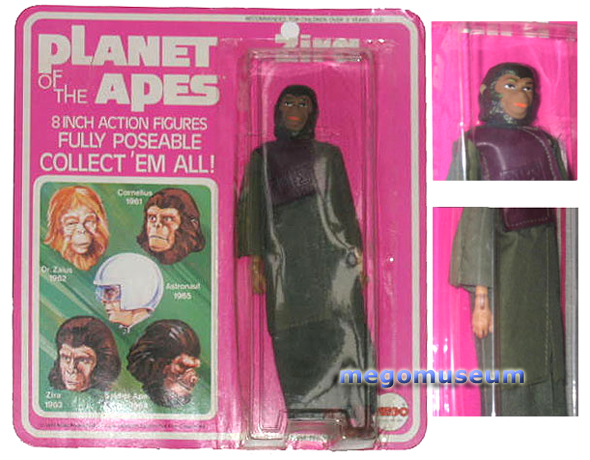 Zira, the lone female of the Planet of the Apes action figures, is the chimpanzee wife of Cornelius. In the film, she is recognized as a doctor (an Animal Psychologist – of course, the “animals” were Humans! 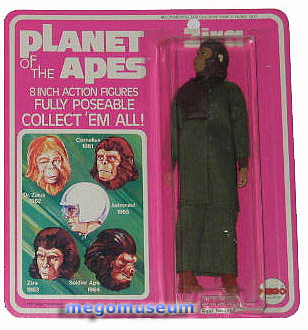 ), but Mego did not give her the “Doctor” designation bestowed upon Zaius. Her top is green fabric with vinyl details (color ranges from maroon to dark brown) and snug inner sleeves of brown fabric. Her skirt is made in matching green fabric with no vinyl details. 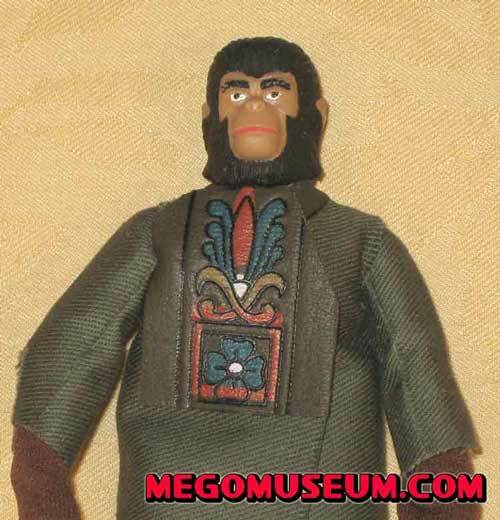 For reasons unknown, Mego put Zira in caramel colored western styled boots. There is a recognized variation which LACKS the brown inner sleeves. In truly pristine examples, the green fabric possesses a beautiful silky sheen. 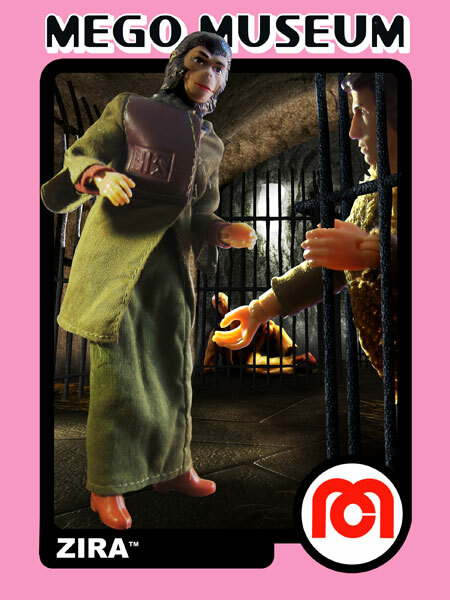 She can also be found carded with a brown skirt and green top, green skirt and brown top, or in a brown skirt and top. It is unclear whether these are color changes caused by unstable dyes in the fabric or true variations. There is also a variation with a greenish tint to her hair. 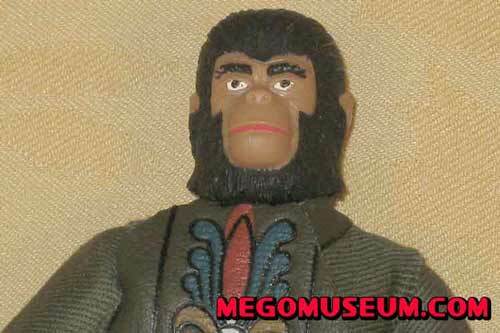 From an astounding Mego Showroom find comes this prototype Zira card and pre-production figure. Designed by the collection’s original owner, its dull mauve color was bluntly panned by Mego chief Martin Abrams and changed to the final vibrant pink. 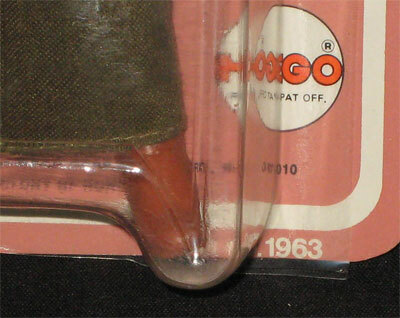 The packaging date reads “1973 Apjac productions” which was changed to the correct 1967 date when the figures went into production. The mauve mock-up card has no backing artwork. 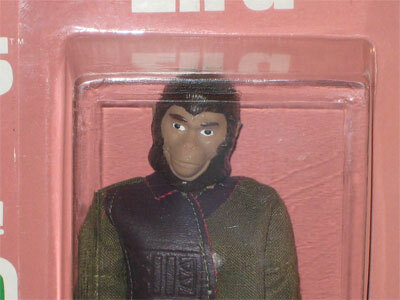 Note that the pre-production Zira lacks the paint detail in the eyes that the production pieces would later have. 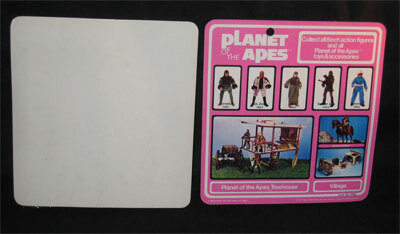 When Mego first proposed the Planet of the Apes license, the R & D Department created early mock-ups to visualize the concept. While this practice is common in the toy industry and occasionally such mock-ups can be seen in toy promotional materials, they rarely surface themselves. This is mostly because they were simply discarded after production began. Thanks to the foresight of a then junior Mego employee we can see the crude, yet charming first attempts at the line, 35 years after creation. This early Zira has an outfit made of denim, with patterns on the leather patches that have been hand painted. While hardly screen accurate, it is really interesting. Gender confusion! 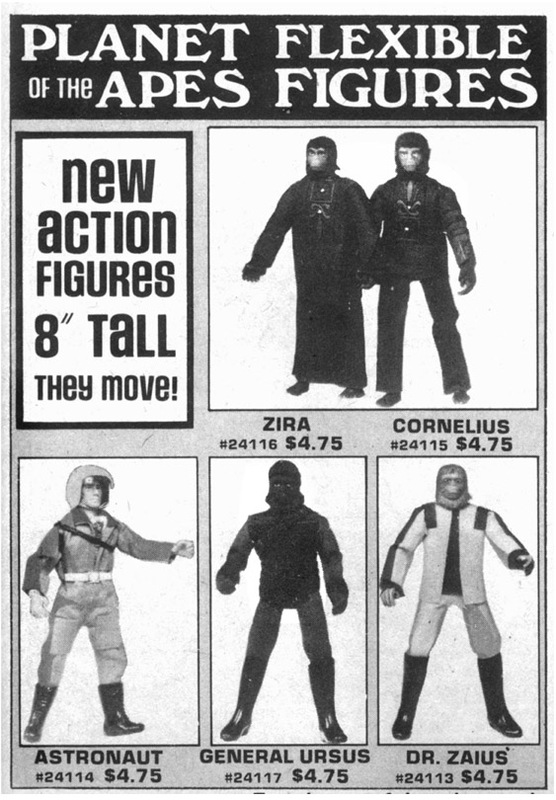 Not only is the Zira body merely a type 1 Action Jackson body, but the head is actually the Cornelius model kit and not the Addar Zira. 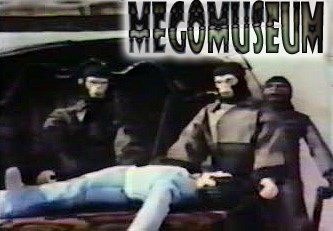 The reason as to why Mego did this is probably lost to time, all apologies to Kim Hunter. The figure also features hands and feet crudely painted brown, with no footwear. 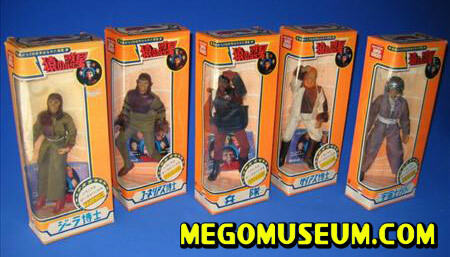 So far, these figures have only been found in print once, in Famous Monsters of Filmland Magazine. The only finished figure appears to be the Astronaut which lends credence to the theory that his head sculpt came from another project. Zira wears caramel colored cowgirl boots. They are the same boots also found in the Dinah-Mite Wild Western set. 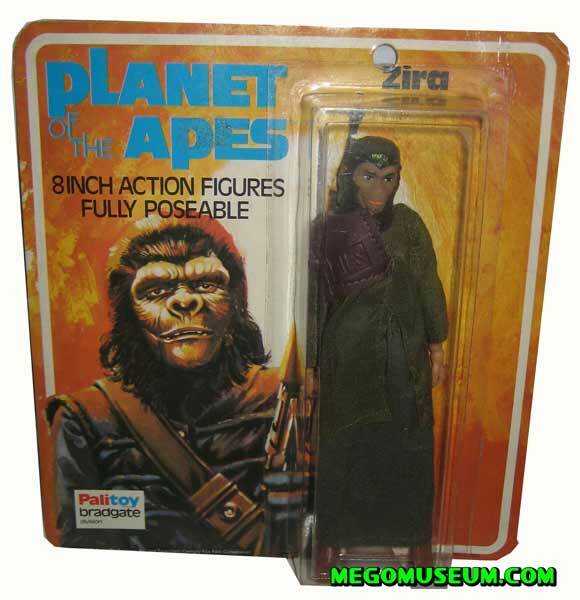 They have not been factory reproduced even though EMCE Toys made a reproduction of the Zira figure. 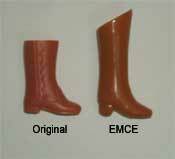 EMCE’s Zira wears Uhura style boots made in the same caramel color as Zira’s cowgirl boots. 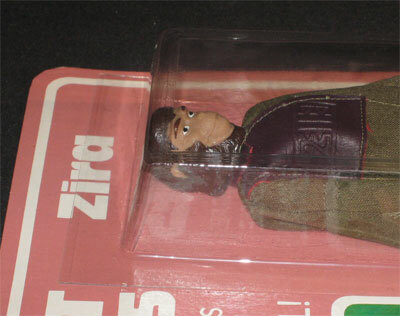 Zira’s coat has been factory reproduced by EMCE Toys. The material used is very close to the original. Is the color accurate? Really, that’s near impossible to say. Original Zira clothes tend to fade differently. 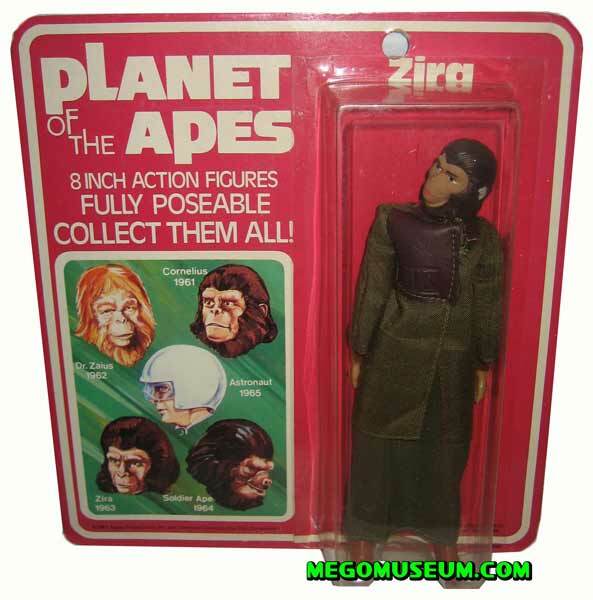 Comparing several original loose Zira figures, you’ll find the shades of green in her clothes vary a bit. 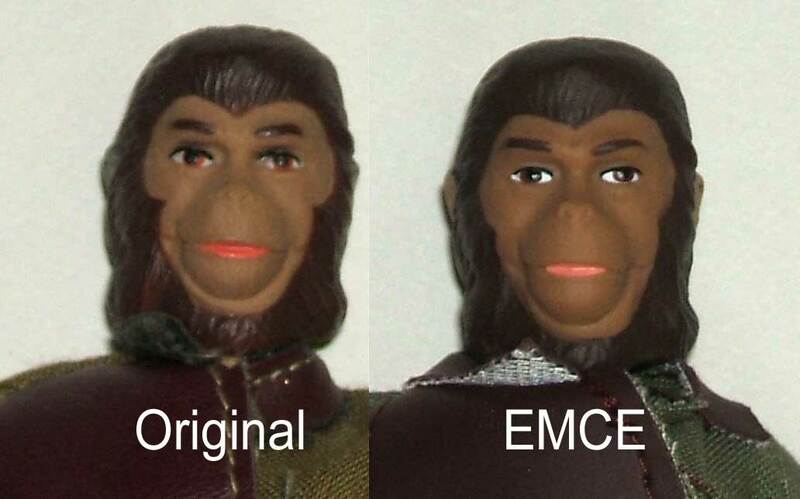 However, the EMCE version is a bit greener than most. The EMCE reproduction also features the brown inner sleeves, and while it’s more common for an original to have these, some do not. The EMCE coat is made a little wider, so it fits a bit more baggy. The vinyl trim is different as well. 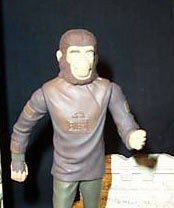 While Zira’s vinyl originally came both in brown and burgundy tones, EMCE reproduced only the burgundy version, and their burgundy leans more toward the brown side of burgundy than the original does. It’s also a smoother vinyl, as he original vinyl has a slight texture to it. It’s also shaped a little differently; most notably it’s longer. The original Zira has the vinyl sewn right into the sleeve, whereas the EMCE does not, even though the width is the same, which is a result of the reproduction being slightly wider overall. The collar on the repro is also a little wider. 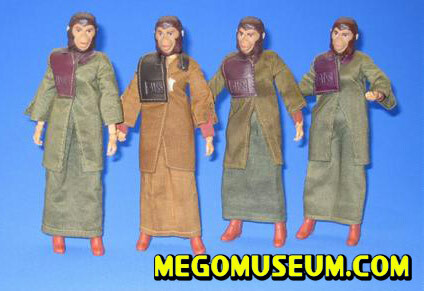 Zira’s coat features something rarely used in Mego clothes construction, velcro. 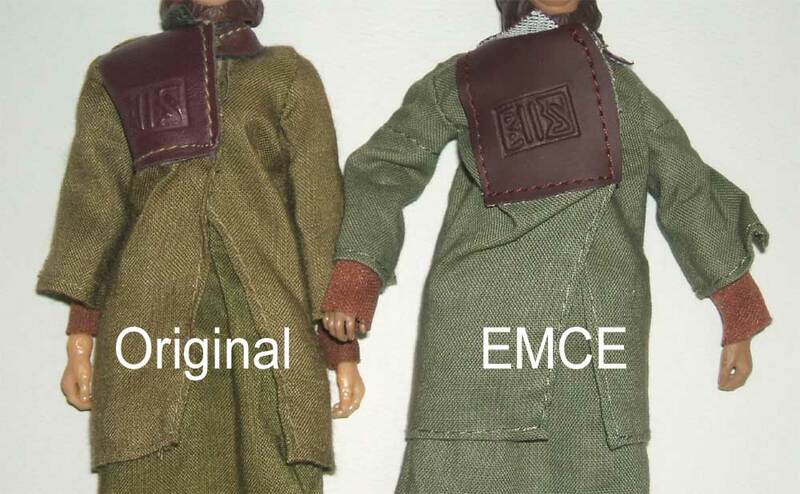 EMCE’s also uses velcro to close the coat. The reproduction coat is overall a little shorter than an original, and is unmarked. 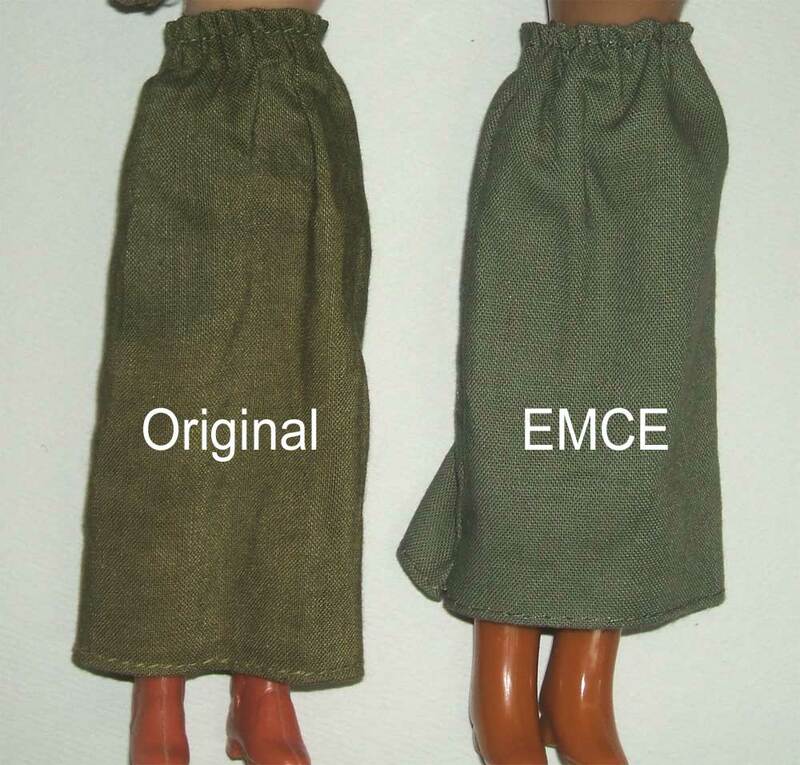 Zira’s skirt has been reproduced by EMCE Toys. The material used is very close to the original. Is the color accurate? Really, that’s near impossible to say. Original Zira clothes tend to fade differently. 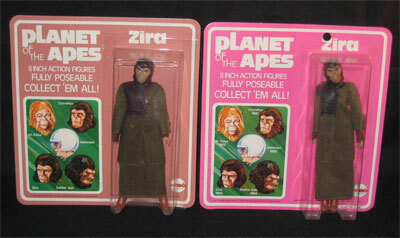 Comparing several original loose Zira figures shows that the shades of green in her clothes vary a bit. However, the EMCE is a bit greener than most. 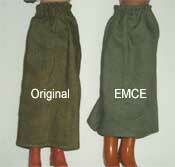 The EMCE skirt is wider than an original, and is shorter in length. It is unmarked. 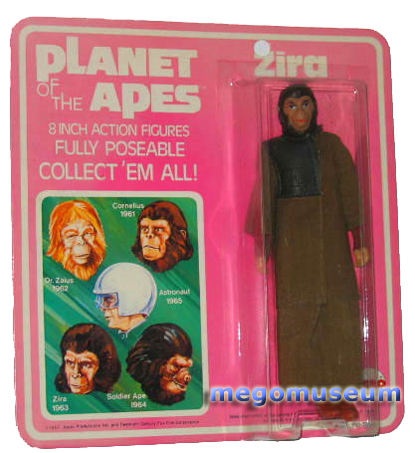 Zira’s head has been reproduced by EMCE Toys. The vinyl on the reproduction is a little more firm than on an original and the details are a little softer and less defined. It is pretty accurate is size, with very slight paint variations. Underneath the head where the neck hole is, the original is more concave; the EMCE is fairly flat. The EMCE is marked with a 1968, 2008 Fox copyright on the back.